This has been quite a day, indeed! And frankly I’m just as confused as you probably are! I’m sure you’ve seen the videos where I react possessively when anyone, human or cat, approaches the keys of my beloved piano. Gabby (pictured above – she’s the smaller one) has on more than one occasion been subjected to a paw on the head and a hiss from yours truly when she ventured too close. So, why and how could this photo even exist? And yet there we are – sharing the keys. Of course, she merely stood there and posed for the camera. I’m still the only piano cat in this household. Could this be the shape of things to come? Have I abandoned my sole ownership of the 88? Could this be the beginning of a beautiful (and sharing) relationship? We’ll just have to wait and see. 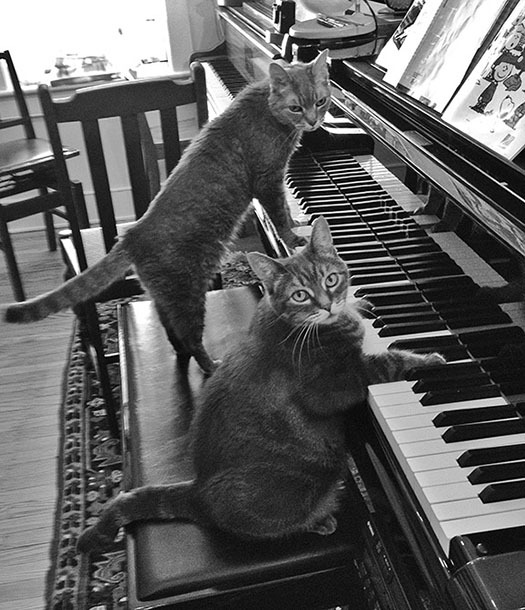 I think a kitty duet would be awesome, if you could open your mind up to it, Nora!